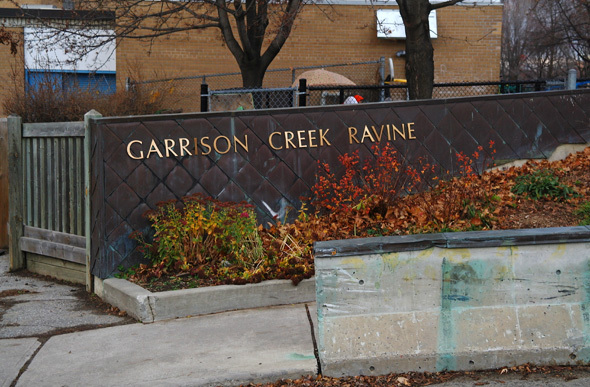 Despite a prolonged interest in the long buried Garrison Creek, I realized the other day that I'd never actually done the City of Toronto Discovery Walk that traces the river's former path. Well, actually, it'd be more accurate to say that despite having walked the route at least 25 times, I'd never done so in any formal or regulated capacity. And, after my recent interview with Michael Cook, an underground explorer and Toronto waterway buff, I decided that it was time to change that. 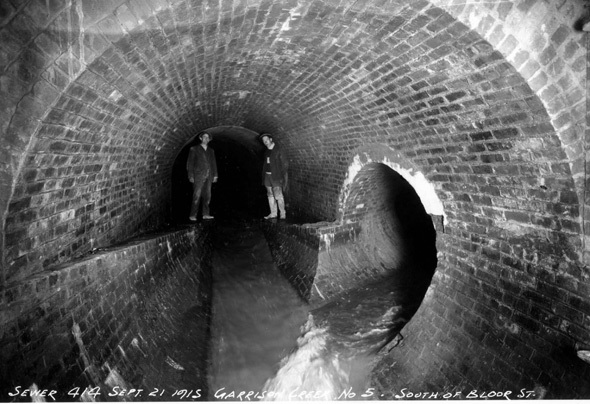 Although perhaps not quite as exciting as getting into the Garrison sewer system, an overland investigation of the creek's remains is actually more interesting than one might think. 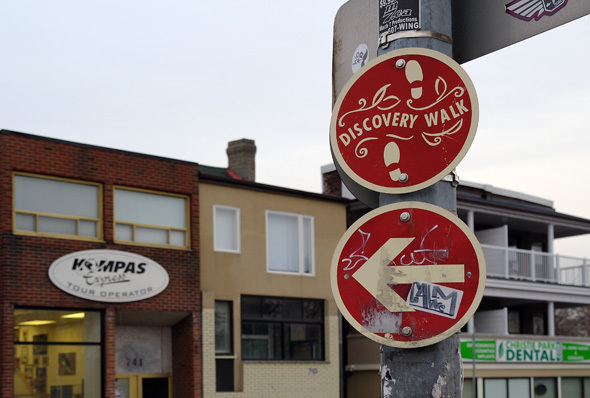 The Discovery Walk guide suggests that one starts the walk at Christie Pits, which is totally fine. The only problem with heading south from here, however, is that you miss one of the more interesting bits of evidence of the creek's existence that remains. 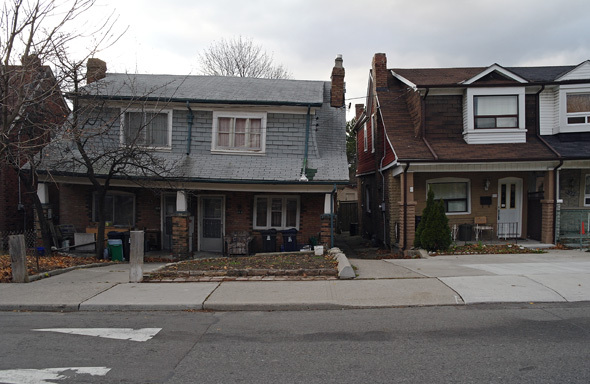 The houses depicted below, located on Shaw St. just northwest of the Pits, look as though they're ready to fall over on account of the creek running directly underneath them. And, in fact, if one pays close attention to the land in the surrounding area, it's easy to notice the continuous sharp but short decline immediately to the west of the street that marks the waterway's underground presence. 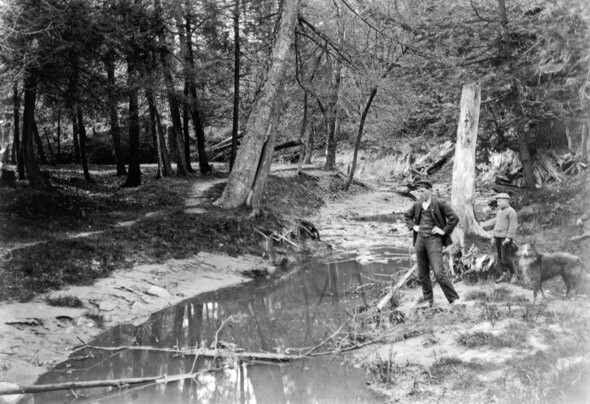 As the historical photo below shows, just prior to burial, Garrsion Creek wasn't exactly a powerful river. True to its name, it was a small system and thus within the means of the City to bury. 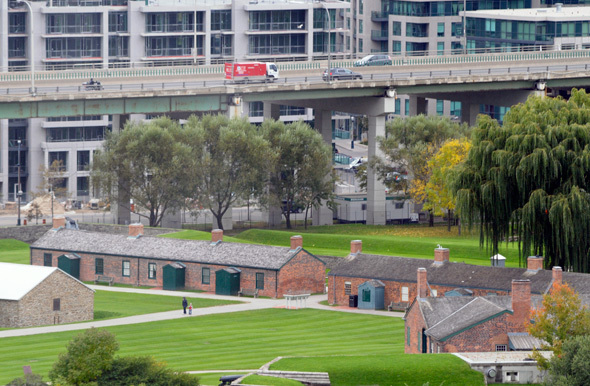 As to what compelled Toronto to do so, the reasons are myriad, but chief among them was the danger that the sewage-filled creek posed to public health and development of the surrounding land. 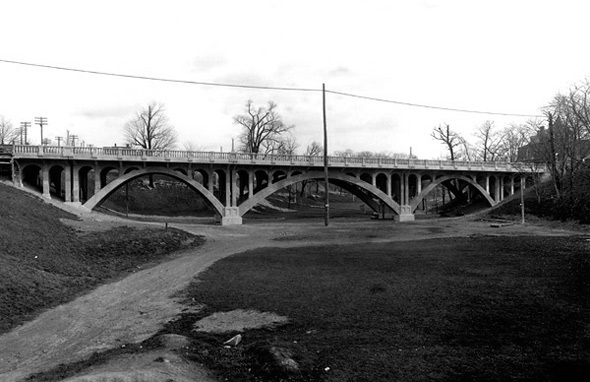 Work on the creek's transformation into a sewer began in the the 1890s and continued northward until around 1920, when the it was completely buried. 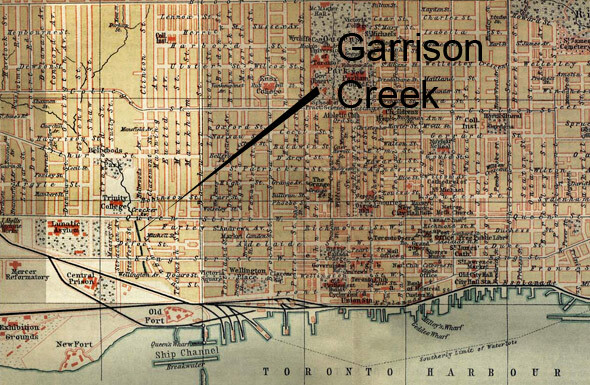 The 1894 map below shows Garrison Creek's route at the time, and what appears to be the beginnings of its sewer-routing south of Queen St. 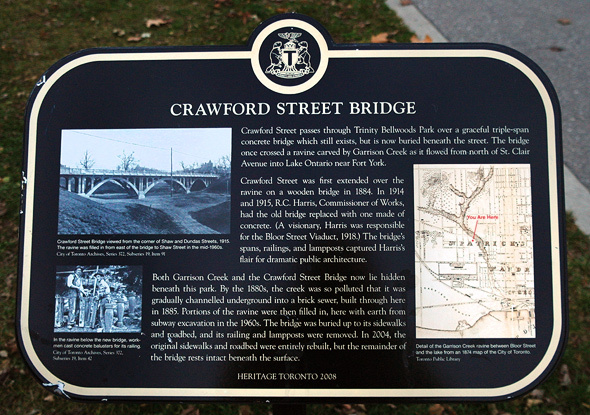 Along with the burial of the creek itself, a number of pieces of infrastructure were lost as well, including bridges at Crawford and Harbord streets, the latter of which can still be slightly seen on the north side at Bickford Park. 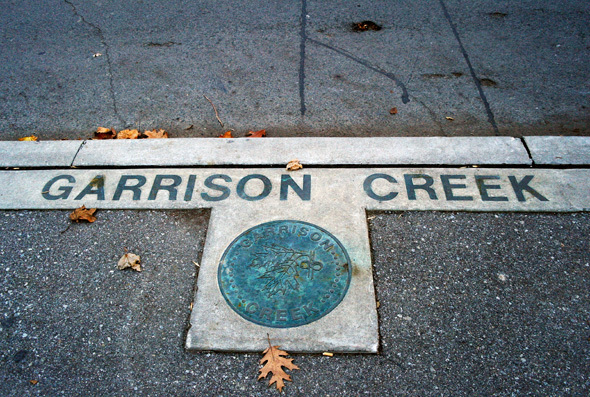 Along with these better known pieces of history, there are numerous signs of Garrison Creek's former existence scattered along its path. 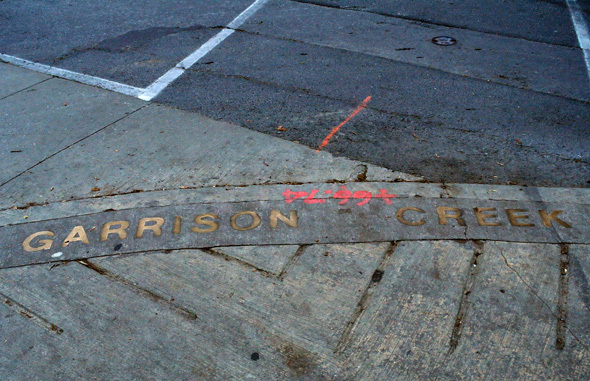 Thanks to a revitalization project in the 1990s, there are now identifying labels and plaques embedded into sidewalks along former banks of the river, and there are even a few sewers that point out the waterway below. 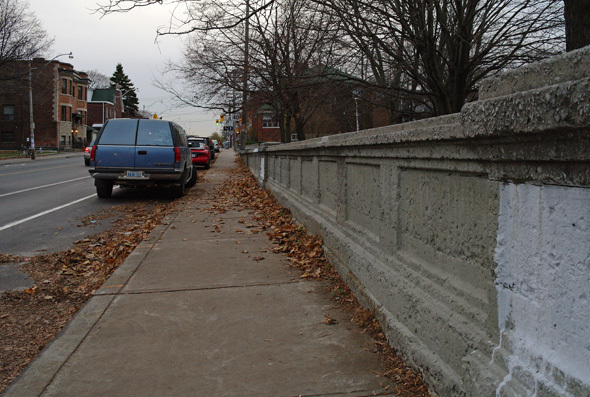 But beyond the official designations, the hour-long walk from around Bloor to Fork York reveals many ghosts of Garrison Creek. Whether it be the Toronto street-plan, odd elevation changes, the annual mini-floods in the north end of Trinity Bellwoods Park, or simply the line of greenspace that runs south from where the creek originates, the waterway is still very much a part of the cityscape. 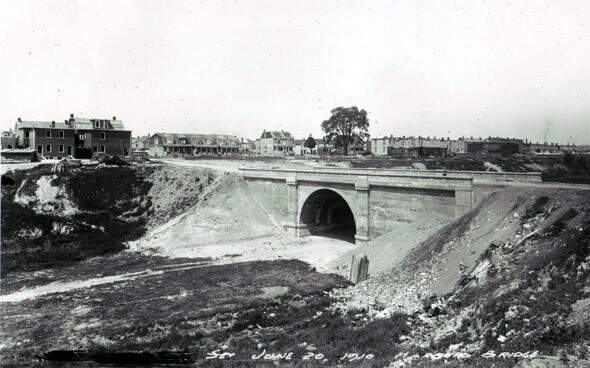 Historical photos are from the Toronto Archives and the 1894 map was sourced via the Wikimedia Commons. All other images by the author.